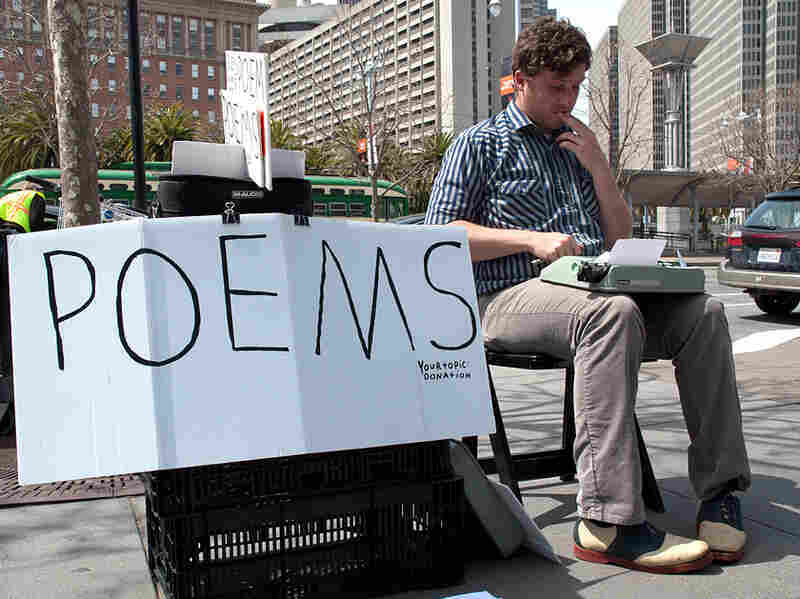 A Poem Store Open For Business, In The Open Air Zach Houston makes a living on the streets of San Francisco by composing poems on a manual typewriter. Give him a topic, and he'll pound out a poem in a matter of minutes — hopefully for a donation that will help him stay in business. Poet-for-hire Zach Houston works at the Ferry Plaza Farmers Market in San Francisco. Houston says he is paid about $2 to $20 for each poem. 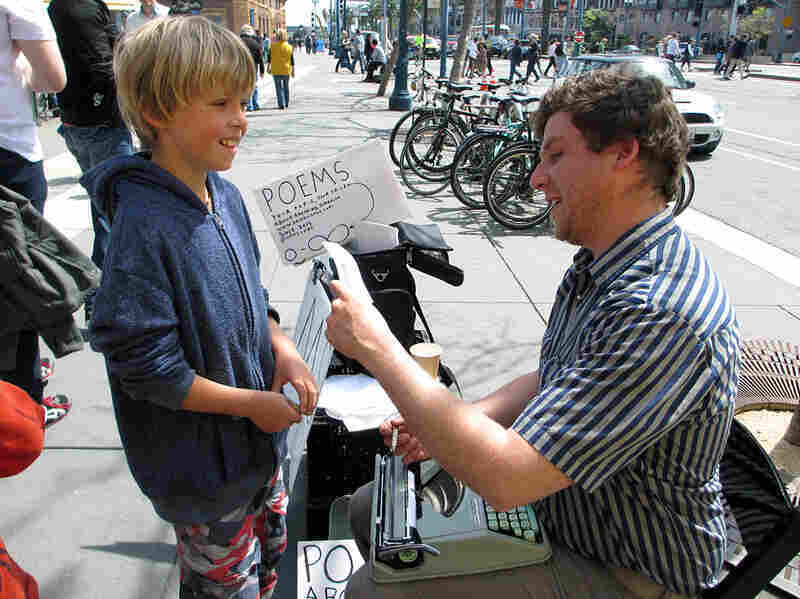 Zach Houston runs his Poem Store (on any given sidewalk) with these items: a manual typewriter, a wooden folding chair, scraps of paper, and a white poster board that reads: "POEMS — Your Topic, Your Price." Houston usually gets from $2 to $20 for a poem, he says. He's received a $100 bill more than once. The Oakland, Calif., resident has been composing spontaneous street poems in the San Francisco Bay Area since 2005. Five years ago, it became his main source of income. "I quit my last conventional job on April Fools' Day, 2007," says Houston, 29. "They didn't believe me, because I said I was going to write poems, on the street, with a typewriter — for money." It was no April Fools' joke. On most Saturdays, you can find Houston at San Francisco's Ferry Plaza Farmers Market. Passersby eye his sign and watch intently as Houston types away on his Swiss-made, green 1968 Hermes Rocket. "Straight out of Switzerland, man," Houston says. "And it's my purse full of language. I love it." forever returning to its source"
"I've always loved poetry. I've always cared about how language works," Houston says. His mother claims that Houston carried a dictionary around when he was little. But even though he loves writing poems, his motivation wasn't "bringing poetry to the world," Houston says. Rather, he thought, "I love writing poems. I bet I could make a few dollars and survive off of writing poems." "Believe it or not, it's not totally a reliable income. Who knew?" he says with a laugh. Zach Houston reads a poem about Legos aloud. The work was commissioned by Miles Fogler, 10. But the career choice has its advantages. Last year, Houston's work was featured at the Nelson-Atkins Museum of Art in Kansas City, Mo., and at SF Camerawork in San Francisco. As Houston stretches his back between writing poems, someone has been standing behind him for quite some time, paying close attention: 10-year-old Miles Fogler of San Francisco, who had been walking down the street with his family when he noticed Houston. "I really like typewriters," Miles says, "and I wanted to see someone write on a typewriter, because I haven't seen anybody do that." And when Miles saw that Houston was writing poems, he decided he wanted one. His topic of choice? Legos (he's building a big structure at home). Houston is delighted. "Legos are amazing," he says. "What a wonder. Discrete units, man." He starts typing. Houston says he's written thousands of poems in the past seven years on his Hermes Rocket. He gives them away to his patrons. He writes his e-mail address on the poems and asks them to send him copies. Some do. In the past, Houston could be found regularly at Bay Area art festivals, coffee shops and farmers markets. These days, Houston primarily shows up at the Ferry Plaza Farmers Market on Saturdays. The rest of his time he now devotes to more private writing. He also toys with the idea of going back to college, Houston says, so he can "get into arguments with poets about how they're using words all wrong."